The passionate aim of this book is that it should help you to 'correctly handle the word of truth' (2 Timothy 2:15). This is a toolbox. Sorry if that conjures up painful memories of failed DIY projects, hours spent waiting for the emergency services on the hard shoulder of the motorway, or rusty, forgotten implements decked with cobwebs at the back of your garden shed. But there are no spanners or trowels here. Rather these tools are a means of getting to the bottom of any Bible passage and discovering its true meaning. The passionate aim of this book is that it should help you to 'correctly handle the word of truth' (2 Timothy 2:15) so that you will experience God's clear guidance in your life, come to know him better and grow to love him more. Our prayer is that your Bible reading will never be the same again. 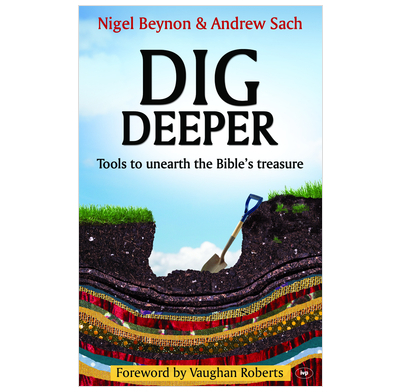 Does what it says on the cover: it provides tools to enable you dig deeper into the Bible's treasure. It is accessible to folk who are new to the concept of this way of getting to grips with scripture, whilst also being a great reminder for those who are already familiar. The worked examples really help clarify the process. Each time I've bought a new copy I ended up giving it away - so last time I bought several! Really helpful to give you a challenging understanding of the wonderful good news of the Lord Jesus as Mark explains it. Useful for individual or group use. Excellent tools - presented in amazing simplicity. It caters for all levels of readers and they don't waste time emphasizing technical theological aspects. The book is well woven and injects excitement into studying the bible. The examples are simple, relevant and easy to replicate. Well done guys - these tools go a long way to address some of the errors which have been passed on from generation to generation, especially in our pentecostal circles. This is a must read for anyone who is seeking proper/accurate study of the word. Does everything it's says on cover and more. Really opens up scripture. A great tool for any Christian to deepen their understanding and passion for God's word. Brilliant: clear, concise, accessible, thorough, orthodox. Opens up scripture to those who are new to it, provides THE tools to understand all those 'tough' passages that till now you've been skipping past, and clears up a LOT of common errors in Bible interpretation and use. Really does what it says its aim is, to help us to 'correctly handle the word of truth' (2 Timothy 2:15). The book is Jesus-focused and makes you want to praise and follow him more! Trying to understand and interpret the Bible for ourselves is hard work: it requires a combination of disciplined study and humble reliance on God’s guidance through His Spirit. That’s why it’s often tempting to over-rely on other people to teach the Bible to us – to be spoon-fed by sermons, group discussions and commentaries. But whilst we should be grateful for the abundance of good Bible teaching available in this country, it is important to remember that we need to check everything we hear against what the Bible says for ourselves (Acts 17:11). This book is ideal for anyone wishing to develop their skills in handling and interpreting the Bible. The authors go through a series of highly practical “tools” which can be employed when approaching any passage of Scripture, and which (if utilised sensibly and intuitively) will greatly improve one’s understanding of God’s living and active word. This book is essential reading for anyone who regularly leads Bible studies but is also highly recommended for all Christians who want to improve their grasp of Scripture and to discover its true meaning. However, it should be emphasised that improved intellectual knowledge of the Bible on its own is useless without humility and obedience – the ultimate aim is to know God better and so follow him more closely. This book is brilliant for helping you to understand the Bible. It's written in such a way that its really accessible for Christians new and old. Each chapter focus' on a different 'tool' and has worked examples and also examples for you to do yourself. Using the tools can make Bible passages seem much easier to understand. I've only given it 4 out of 5 though because it could also lead you into the trap of making Bible study simply an intellectual thing rather than time spent learning about God. This is a fantastic book, that gives helpful ideas in how to understand and interpret the bible correctly and apply it into our lives. It uses 'tools' to show you how a passage is meant to be understood in the correct context and enables you to further your love and knowledge of Jesus. A great book to read yourself or to give away to young Christians in order to help them understand the bible correctly. A top quality book! Go on buy it! Clear, concise and comprehensive. It's a wonder to me, that nobody had written such a book before this: truly a gem. I have given it as 'required study' to my senior leadership team. Essential to master these simple tools if you want to lead a Bible Study (especially if you write your own). Very useful if you're wanting to get more out of your own, personal study of Scripture too.